Although faith is a gift from God, it is learned and practiced and passed on through the community of faith. My mother and father assumed that I would always have faith. They raised me in Hinton Avenue Methodist Church [United was added in 1968]. It never occurred to them that by the 21st century Christian faith could no longer be assumed. My parents attended early worship service every Sunday. Families now attend church 1.2 Sundays/month. The world has changed! And now, faith needs to be taught with joy, intentionally pursued, and given to the next generation. People are not Christians so much as disciples of Jesus Christ and his way of living in relation to the others and the world. Trinity expects the best from its leaders. Our spiritual formation is overseen and nurtured by all our teachers and substitute teachers, Harriet Latta, Pastor Eileen, Pastor Keith, Jerry, Catherine, our lay leaders Leslie Vorndran and Jose Rivera, and me. We are committed to making spiritual formation sound in biblical principles, relevant to life, and challenging. The spiritual formation team at Trinity is committed to deepening our awareness of God, and equipping our children, youth and adults with a strong foundation of stories of the Bible. Our ministry and education teams have everything prepared for the fall season. 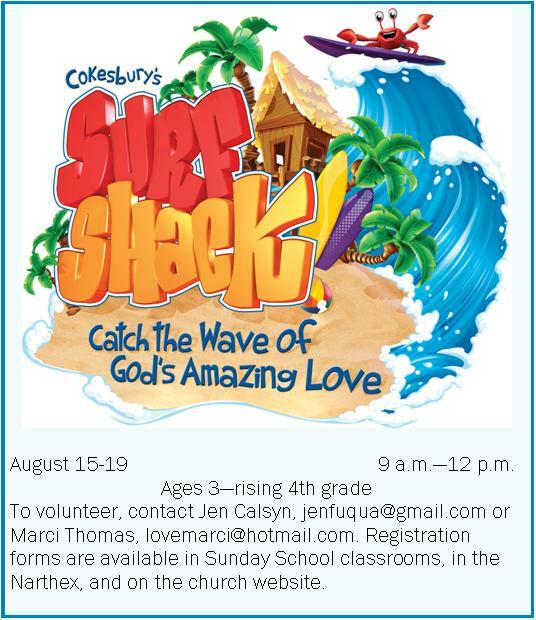 Join us for our Sunday School Jamboree, in September, and the beginning of a wonderful year of learning about God through the love of Jesus Christ. Happy August to you. Have you had a chance to get some time away? I hope so. It’s vitally important to break away from your daily routine. It gives us a chance to spend time with family and friends, maybe catch up on movies and reading, and get some much-needed rest. We Americans are really bad at taking vacations. No, we’re more than just bad at it; we stink at taking time off. Europeans have this thing figured out. According to Fortune.com, “Compared to people living in France, Germany, and Scandinavia, who routinely take as much as six weeks off annually, U.S. employees typically leave about 429 million paid vacation days on the table every year.” I can’t even wrap my head around that. We are most certainly on the opposite end of the spectrum from Europe when it comes to time off. Why do we ignore the chance to take vacation? The thought of what awaits us when we return can be a big factor. For those who work in an office, Fortune.com reports the fear of work piling up during our absence is enough to keep us from ever taking a vacation. But then, of course, the stress from working all the time without a break can also take a toll. Whether you have planned an elaborate trip or simply a few days for a staycation, I hope you’ll take some time off. I also hope you’ll consider making room for God in your down time. There are a lot of great devotions and meditations available. You can even find multiple Bible apps—they make for light packing! Wherever you go in these last weeks of summer, know that your Trinity family is keeping you in our prayers. We look forward to hearing about your great adventures; send us a postcard if you get the chance. Safe travels. As Confirmation Class 2016 was presenting “Tell Me Who I am” on Pentecost Sunday, I could not have been more proud and honored. We met Sunday mornings at 9:30 from fall to spring; all the confirmands participated with sincerity, curiosity, and consistency. We also had a group building session where we sang, played games, made t-shirts, and worked on faith statements. In addition, the parents provided practical support, encouragement, and fun. The confirmands and parents gave tremendously to the whole process. Moreover, the confirmands offered a moving presentation about their identity in Christ. I felt that they gave me more than what I have given them. I share all this because Confirmation 2016-17 is about to begin in September. Therefore, if your child is a rising 7th grade or older and has never been confirmed in the church, then please consider having him or her join the class. We will meet on Sunday mornings at 9:30 beginning late-September and end in mid-June. We will have lock-ins, field trips and engaging classes. 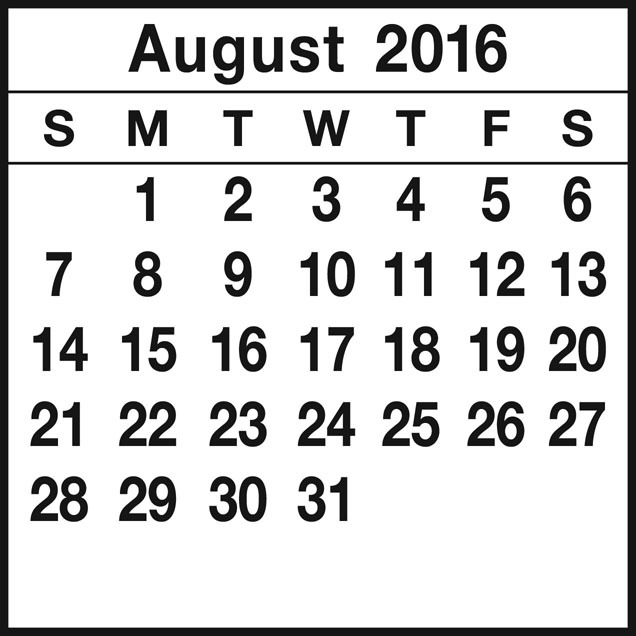 A Confirmation packet with a schedule will be available toward the end of August. Finally, I would to ask three parents to volunteer as group leaders for the whole year. Last year Jamie Loving and Loren Monroe, who participated in almost every session, helped us to engage in class and build relationships with one another. Looking forward to another outstanding Confirmation class! 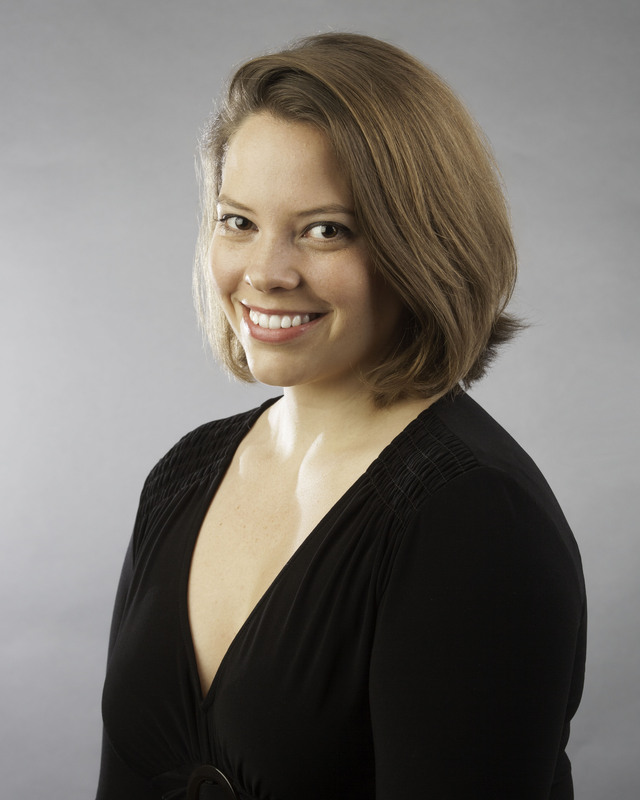 Music: New Children’s & Youth Choir Director & Choirs Resume in Sept.
Dr. Catherine Wethington is Trinity’s new Director of Children’s and Youth Choirs; you will already know her from her five years as Trinity’s soprano section leader and 8:30 a.m. song leader. Catherine received her B.M. in Voice from the University of Michigan, Ann Arbor; she earned her M.M. and D.M.A. degrees from The Catholic University of America. Dr. Wethington has had extensive experience with music, children and church; she appears frequently in principal roles with area opera productions, she has taught chorus and private voice at the Potomac School for the past four years, and she has sung for church services, weddings, and funerals since she was in high school. She will be the music instructor for this month’s Vacation Bible School at Trinity. In addition to her music background and teaching experience, she will bring energy, enthusiasm and a desire to assist our young singers on their faith journeys. If you’d like to talk with Catherine about our Children’s Choir, you can see her after the 8:30 or 10:30 services. If you have a child who wishes to join our Choir, please email Catherine or simply bring your child to the Wednesday 6 p.m. dinner and practice in Langley Hall when rehearsals resume in September. You’ll serve God through musical prayer and help others praise God through hymns. You’ll stimulate your intellect by engaging both sides of the brain. You’ll have a creative and enjoyable way to express emotions through music. You’ll belong, feel wanted and be a part of something positive. You’ll gain self-confidence through teamwork. You’ll improve your music skills while enjoying both traditional and contemporary styles. You’ll create an extended family and find new friends (42 million Americans are in choirs). You’ll be in good company: actors (Anne Hathaway, Brad Pitt), singers (Beyoncé, Kristin Chenoweth), athletes (Troy Aikman, Andy Pettitte) and presidents (George H.W. Bush, Barack Obama) all participated in choirs. You’ll have the congregation looking up to you—literally. Trinity Ringers at 6:30 p.m.
Posted on July 28, 2016 Categories Children, Education, Music, WorshipLeave a comment on Music: New Children’s & Youth Choir Director & Choirs Resume in Sept.
Crafts for a Cause sent 65 handmade dresses to Uganda a few weeks ago, supporting an active ministry called Dress a Girl Around the World. The simple cotton dresses fit girls from toddlers to teenagers and have been distributed in Africa, Asia, Central America and elsewhere. We will continue to make the dresses, so if you’re interested in participating come to one of the Crafts work sessions. In August, we’ll be meeting Mon., Aug. 8, and Mon., Aug.22 from 7 to 8:30 p.m. in Room 124. 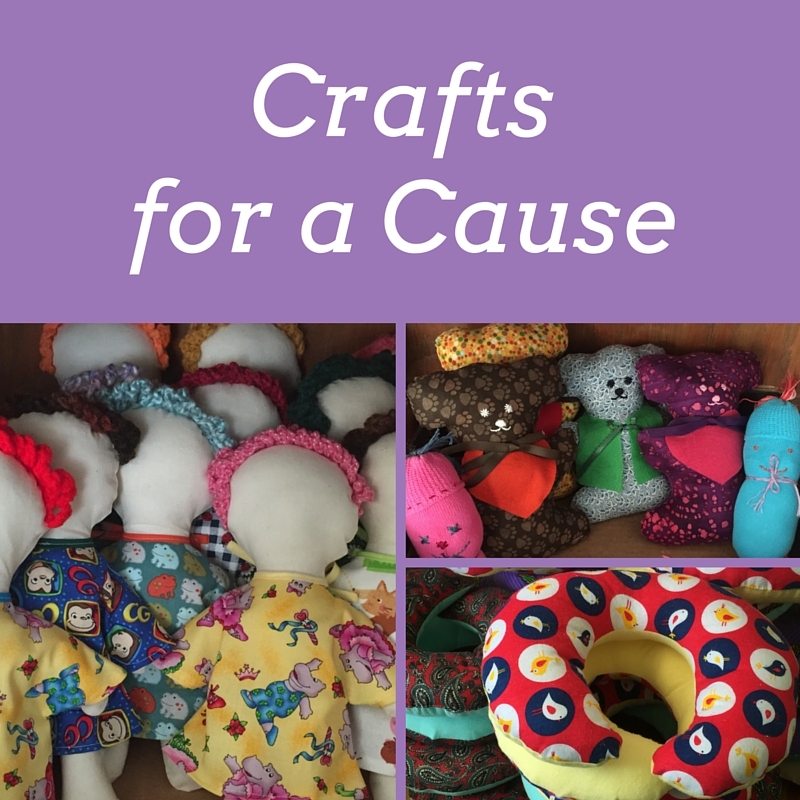 In addition to the dresses, Crafts will continue working on the comfort items we provide each month to Fair Oaks Hospital. We are also already working on items to sell at the Crafts Holiday Bazaar in November. There are lots of opportunities to have fun and make a difference, locally and globally, so join us! No need to be crafty – just helpful. For more information, contact Molly Sprouse. Moms’ Group will meet Thursday, August 4, from 7 – 9 p.m. We will unwind and get to know each other while exploring adult coloring at the Briscoe home, 1117 Kensington Rd. (McLean). Karen will provide light refreshments! Bring your own coloring books, markers, pencils and crayons OR just come as Karen has plenty to share! All are welcome. One way to keep up with our mission activities is through the mission trips blog: http://tumcmissiontrips.wordpress.com/. Updates are posted when trips are announced and during the trip. We invite you to like our facebook page. Our facebook page often includes details about upcoming events, important information, photos and videos. Did you know that each week, the pastors film their message for the Wednesday noon service? If you can’t be in the Chapel at noon, simply log into facebook at noon and you can see the message. Photos, photos and more photos. 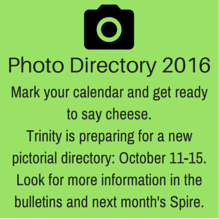 Want to see photos from the last event at Trinity? See what’s happening with our missionaries? Follow us on instagram. Follow us on twitter for daily verses, thoughts, quotes and of course, summaries of what’s happening. About Us contains information about staff, contacting us, directions, etc. Worship includes information about worship services, Sunday morning childcare, prayer requests and weekly recorded sermons. Get Involved will help you find the right area for you to connect with your church family through community service, mission, music, links to our social media, sponsor the altar flowers on Sunday and lots of other volunteer needs, such as teaching, driving, painting, etc. Education for children, youth and adults is listed in this section. 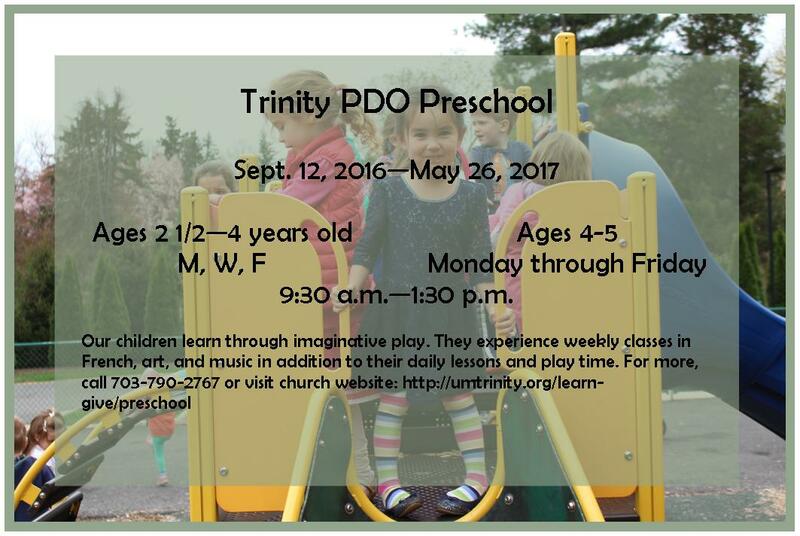 Preschool offers details about Trinity PDO preschool, a weekday school for ages 2 1/2—5. We are still enrolling for the fall! Calendar seems self-explanatory, but offers much more. In this section you will also find building use requests, Trinity News with link s for weekly bulletin and monthly newsletter and information about weddings and baptisms at Trinity. Give is a section that helps you understand different ways of giving to Trinity, even when you can’t be here for worship on Sunday morning. We invite you to check us out online! 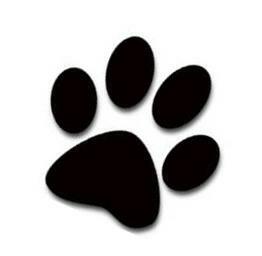 If you have something that needs promoting, please send it to hlatta@umtrinity.org. Posted on July 28, 2016 Categories Biscuit/Duke/Henny, Children, Church & Society, Education, Missions, Music, Pastors' Articles, Worship, YouthLeave a comment on Trinity Is Online! 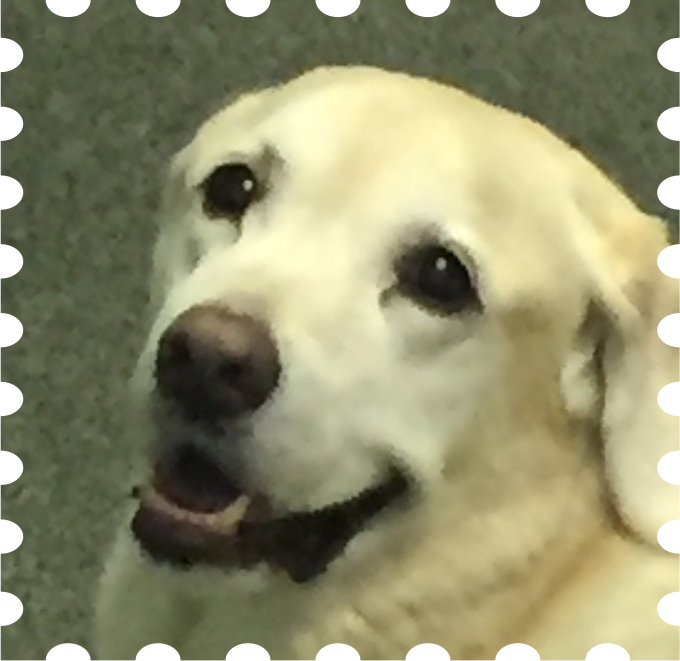 Ask Biscuit: Why Does Jesus Make Thunderstorms? Hello to all the kids of Trinity Church! I hope your summer is awesome. Have you noticed that summer can bring more thunder and lightning storms? The heat of the day can mean more storms in the afternoon and evenings. My friend Bennett has noticed that and he is wondering why Jesus made thunderstorms. Good question, Bennett! It helps to know why we hear the thunder and see the lightning. All thunderstorms make lightning. In those storm clouds, tiny bits of ice and water are bumping into each other. When they bump around, they can make an electric charge. You can make a tiny amount of static electricity by rubbing a balloon on your head, or wearing socks and shuffling your feet on carpet. But, the electric charge in the thunderstorm is a lot bigger than what you can create with the carpet or balloon! Now, back to those thunder clouds. The electricity comes shooting out of the clouds—that’s the lightning. How do we get thunder? Well, the lightning zips through those clouds so fast that it makes an air hole. When that hole comes back together again: BAM! That’s the sound of thunder. Very cool. So how did this all start? We read in the book of Genesis (the very first book of the Bible) that God made the sky and everything in it: our sun, moon, stars, clouds, even the lightning and thunder. Lightning and thunder are mentioned a bunch of times in the Bible. In Psalm 97, we read that God’s lightning lights up the world. In the book of Job, we see where God controls the clouds and makes his lightning flash. God is powerful! Just like everything else in nature, God made the rain, thunder and lightning. Sometimes those storms can get bright and noisy. But, I hope you’ll look at them differently next time you see them. Lightning and thunder are really just a cool science project made by God! Posted on July 28, 2016 Categories Biscuit/Duke/Henny, Children, EducationLeave a comment on Ask Biscuit: Why Does Jesus Make Thunderstorms?